How To Order Expanded Metal - Industrial Steel & Supply Co.
Side shearing is a cut made parallel to the LWD dimension of the sheet which usually leaves open diamonds. Standard tolerance SWD is plus or minus 1/16″ when both sides are sheared. This cut is made along the length of the sheet on the center line of the bond over the specific width. In most cases it is not practical to attempt to Bond Side Shear either standard or flattened expanded metal, because of camber. The process of shearing a piece of expanded metal to the specific length (LWD). This cut normally leaves open diamonds at both ends but accomplishes close tolerance (plus or minus 1/16″) when both ends are sheared. The process of shearing a piece of expanded metal to the specific length (LWD). A plus or minus 1/16″tolerance applies when both ends are sheared. One end is cut on the Bond parallel to the SWD, the other end usually has open diamonds. 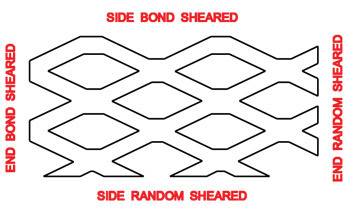 NOTE: When End Bond Shearing is requested for both ends, the sheet at the center of the bond over the specific length. A tolerance minus 0 plus ½ diamond applies. It is possible to End Bond Shear, but extraordinary care must be exercised to maintain the squareness of the sheet. When all four sides of a sheet of expanded metal are sheared, the maximum tolerance will be plus or minus 1/16″ per foot of width. The following information should always be included when placing an expanded metal order. Specify the number of pieces wanted. 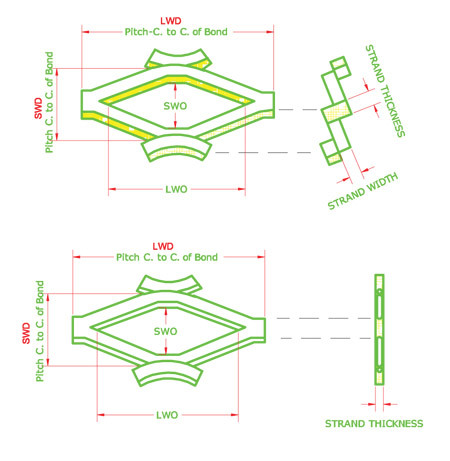 Specify the nominal width of the diamond SWD. Specify the style of the sheet. Example – #18, #9, or if aluminum, .081, .051, or if grating, 4lb., 5lb., 3.14lb., etc. Specify whether standard or flattened. 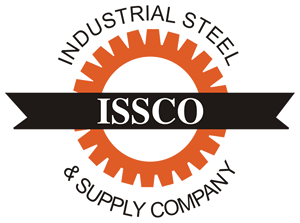 Specify the type of metal wanted -Example – Carbon steel, stainless steel, aluminum, etc.